I've never heard of Miami Brewing until I received this can as an extra in a trade. Some research shows that Miami Brewing is a product of the Schnebly Redland's Winery. Winemaking was their first passion, but did they make a mistake turning to craft beer? Yes. yes they did. Pours a dark, copper orange with a finger of white head. The beer has an overpowering sticky caramel and toffee aroma almost like an old Heath Bar. It's not really inviting like a wheatwine as its not something I want to associate with my IPA's. Any toffee on the aroma sticks around for maybe a split second before giving way to an unpleasant metallic flavor. It sort of tastes like bad vegetable juice, but with metal. Imagine expired V8 with some lemon thrown in for good measure.The hops I pick up are earthy and grassy, but more along the lines of mossy, wet grass with no real freshness. The beer does have a pretty good body to it, but can come off as slightly chewy and rough. No alcohol to detect and all of the bad flavors (and possible infection?) don't make this easily tolerable. 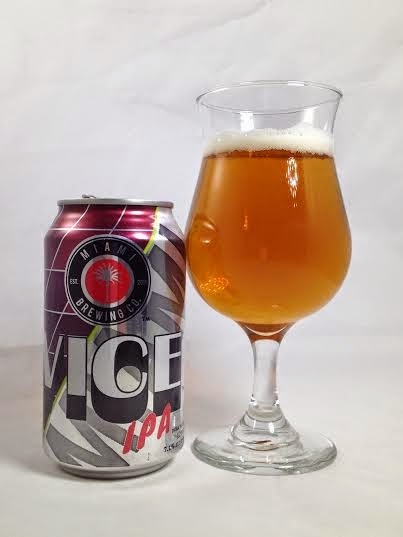 I'm not going to call Vice IPA repulsive, but we are really pushing our luck. The aroma sets the tone as the taste followed up with some of the oddest flavors I've ever experienced in an IPA. There are super dank IPA's with huge onion and garlic notes, but it's almost as if this decided to go for the other end of the raw vegetable spectrum...and failed miserably. I only drank it because it was free, but even I wouldn't advise you to do the same if given the opportunity.